Rain makes me so nostalgic. It takes me back to mossy, other-worldly Vancouver forests. And the slap-slap of my running shoes against wet leaves. And the shhhhhh sound of rain spinning off my bike tires. (I did a lot of exercise when I lived in Vancouver ... ) And curling up, in front of the window, with a cup of tea - taking in the smell of green, of earth, of life. It may seem a stretch to bring you jam today, because strawberries are inherently sunny fruits. More reminiscent of hot summer days than rain. But I do love strawberries. And jam. And scones. And what goes better with a warm cuppa on a rainy day than hot scones and cream and strawberry jam? *As always, use organic ingredients when you can - especially for the strawberries, which are known to be quite high in pesticide residues. 1. Put a small plate into the freezer - you'll use this to test for set. 2. Wash some jars and lids in hot soapy water and then put them into an oven at 120C to dry. I use the vacuum seal ones that all my store-bought jams come in ... when you put the hot jam into the jar and put the lid on, the lid will vacuum seal as the jar cools. I've found my jams have lasted really well this way, but if you prefer you can use the traditional heat-sealing method. You'll need different jars and a different technique, but it is considered safer and the jam will keep for longer. Up to you. 3. Put the strawberries and water into a large stainless steel pot. Bring to a boil and then simmer until the strawberries are soft. Put about 3/4 of your strawberry mix into a glass* blender and puree, then return to the pot. 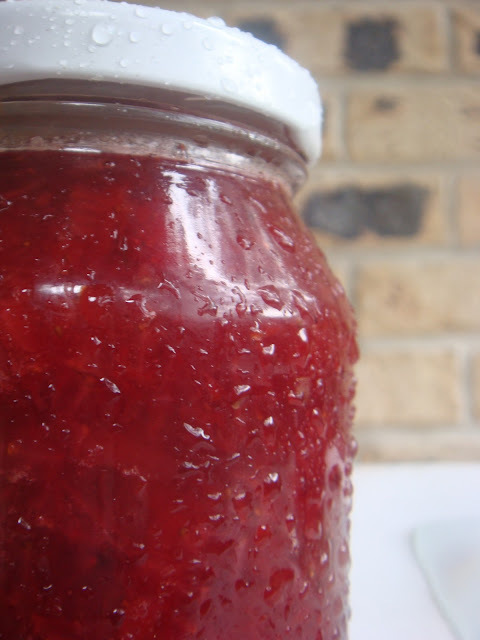 By not puree-ing all the strawberries, you'll get a lovely texture to your jam. *I use glass because the mix will be quite hot, and I'm not really very trusting of hot food + plastic. 4. Add the sugar and lemon juice to the strawberry puree and return to a boil. Then reduce the heat and simmer, stirring frequently for another 10-15 min. until the jam starts to thicken up. Keep stirring so it doesn't burn to the bottom. 5. To test and see if your jam will set, pull the plate out of the freezer and put a little spoonful of your jam onto it. If the jam gets thick and jammy and wrinkly - you're done! If not, keep simmering it for a bit longer till it does set. Sometimes your jam won't set - that's ok! Just use it as a sauce instead. Even better for ice cream. 6. All done? Pull your hot jars out of the oven, ladle jam into them, put the lids on and set aside! Make yourself some scones. And a cup of tea. I've been getting my organic strawberries at the farmer's market - they're 2nds, so only $10/kg! But look at them ... hardly less than perfect. I probably used about $10 worth of strawberries for this batch of jam. The sugar cost me $1 and the lemons I bought for $0.35 each. So ~1.4 kg of strawberry jam cost me less than $12. If you've got a favourite scone recipe, want to share it with us? It was great to meet you today! 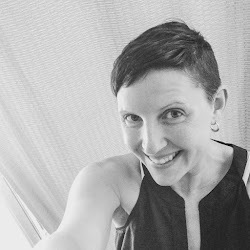 Your blog is lovely, so many great ideas, you've obviously found your niche! And who doesn't like a good strawberry! @AnonymousHmmm ... Not sure! I don't see why not - though they might take longer to cook down with the sugar, as frozen berries tend to have a lot of moisture. Give it a go, and let us know how it worked!